I have started the third in the five sculptures I intend to have ready for showing at the Krasl Art Fair On The Bluff, next month, July 9th and 10th. The sculpture Sublime Transition (shown here) is just beginning to show the vertical transition of the sublime “change of state” from its solid base to becoming vaporized. Right now as I work the piece to accomplish this impression, I look to find a balance in the volume where this occurs in equal amounts throughout the vertical rise. I seek to derive the viewer experience that they are witnessing a dematerialization of the form. I must work the entire piece throughout its length, up and down while constantly revolving it to insure the impression is equal from all points of view. Because the piece is so tall it will push back the optimal viewing distance to perhaps ten feet or more. So when working the piece I have to continually step away to that distance. To not take this into account as I work through balancing the form would be to ignore the parallax distortion that occurs from working up close. 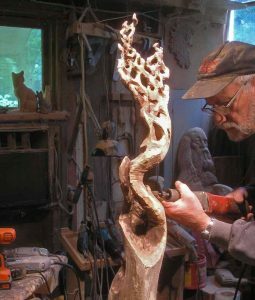 Once the form I am looking for is found I can begin the refinements that will make the piece spark.